With a week to go until the FIFA World Cup Fare has launched three initiatives in Russia this summer – a Diversity Guide, a Diversity House initiative and a WhatsApp emergency hotline. The Diversity Guide offers specific guidance and safety advice for the LGBT community and ethnic minorities travelling to Russia. It is a comprehensive online resource combining travel advice and important information including historical context, Do’s and Don’ts and what to expect in each of the 11 host cities. 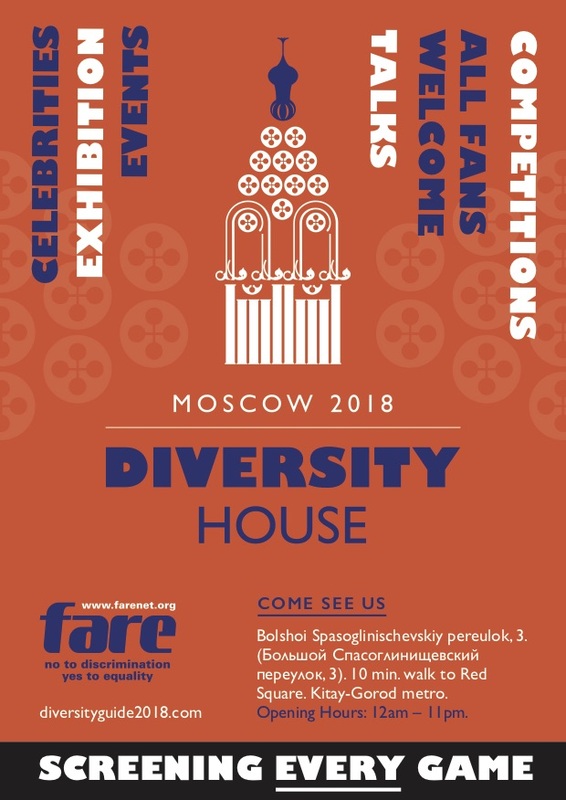 Fare will be running a Diversity House project in Moscow and St. Petersburg during the period of the World Cup. The Diversity House concept is a safe place to celebrate diversity and meet people using football to create awareness and change. Both Diversity Houses will feature a football exhibition, World Cup match-viewings, discussions, meetings with Russian supporters and residents. It is open to all Russians and visiting fans every day of the World Cup. Follow @farenet on Twitter for a detailed programme of events and activities. The WhatsApp hotline is being set up to help support visiting minorities in Russia with issues of discrimination to report or who require other urgent help. The line will be active from the start of the World Cup. The number is + 7 916 948 11 08.